Google announced the latest version of Android – 7.1.2 – for the Pixel and Nexus 5X as part of their Beta program earlier this week, and an interesting feature has been noticed by users of the Nexus 5X: Fingerprint gestures. The fingerprint gestures, which allow you to swipe down on the fingerprint reader on the rear of the phone to access your notification panel, were a feature announced by Google as a Pixel only exclusive when they launched the phones in October last year. The discovery that the Nexus 5X and 6P used the same fingerprint sensor as the Pixel phones led many to believe that the feature could be ported easily to these earlier Nexus devices. This seems to be coming true with Nexus 5X owners on the 7.1.2 Beta now seeing Fingerprint Gestures. 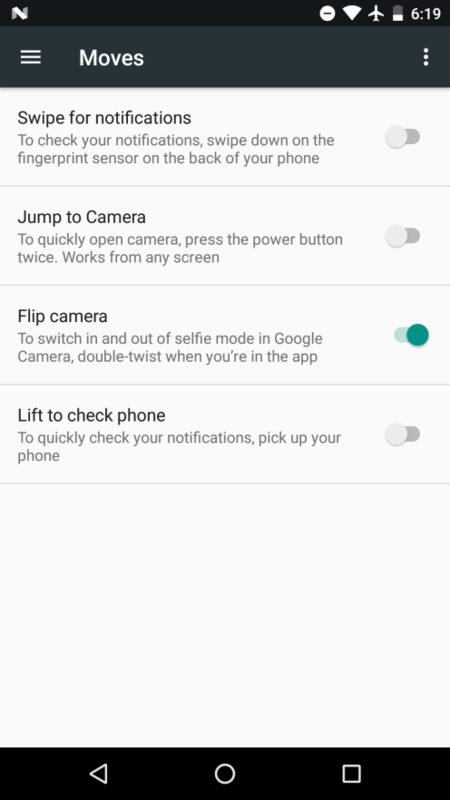 The feature shows up under the ‘Moves’ category in Settings, simply download the Beta and install it on your Nexus 5X, turn it on and you’re off and racing. Of course you can always do a bit of hacking on your phone to get fingerprint gestures working, even if it’s not a Pixel or Nexus if you use Fingerprint Quick Actions, but an official feature for Nexus users is even more handy. Google has so far only allowed the Nexus 5X and Pixel phones to access the 7.1.2 Beta, but given that the feature is live for the Nexus 5X which shares the same hardware it would be logical that as soon as the Nexus 6P gets updated it will see the feature too. A majority of us here at Ausdroid have turned the feature off on our Pixels due to too many swipe errors, but if you want to experiment – you can do it on your 5X and soon, perhaps your 6P. Would love to try this, but my Nexus 5X just bricked itself a few days ago, during normal use, about a month after the end of the 1 year warranty. I wasn’t even enrolled in the beta or anything funky ? If anyone has heard of successful resolutions to bootloop issues, I would love to hear it! My nexus 6P bricked itself too a few days ago. Given that we get 24 months warranty I called Google support. I am currently waiting for my replacement device to arrive. My 6P also awaiting RMA delivery. Bootloop. My case has been escalated to the highest tier of support because it’s been nearly 2 weeks since I ordered my replacement. Waiting to hear from them. Has anyone in Australia actually received the 7.1.2 OTA update yet? Edit: You wouldn’t believe this, but as I was typing this comment the Android Beta notification popped up!